Parasitic infections affect hundreds of millions of people, posing a serious public health threat worldwide. For example, sleeping sickness and Chagas disease are neglected tropical diseases that are caused by the bloodborne Trypanosoma parasite. Historically given little attention, these devastating diseases affect people mainly in sub-Saharan Africa and South America, causing enormous socioeconomic burden. Optical microscopy of bodily fluid samples by trained medical experts remains one of the most common approaches to diagnose parasitic infections in bodily fluids. However, clinically relevant parasite concentrations in bodily fluids can be extremely low. Because conventional optical microscopy typically has a very small imaging volume, it often struggles to provide the sensitivity needed for early diagnosis. Moreover, the task becomes even more challenging when parasitic infections in the blood needs to be detected. Because there are billions of blood cells in each milliliter of blood, and they cause occlusion, making the task of detecting parasites in blood a needle-in-a-haystack problem. Researchers at the UCLA Henry Samueli School of Engineering have developed an inexpensive and portable platform that can rapidly detect motile parasites in bodily fluids automatically. Using their platform, more than 3 mL of a bodily fluid sample can be imaged and analyzed within 20 min, providing a throughput that is orders of magnitude better than traditional optical microscopy-based examination. The research, published in Light: Science & Applications, was led by Aydogan Ozcan, Chancellor’s Professor of Electrical and Computer Engineering at UCLA and the associate director of the California NanoSystems Institute at UCLA, along with Kent Hill, a Professor in the Department of Microbiology, Immunology, and Molecular Genetics at UCLA. 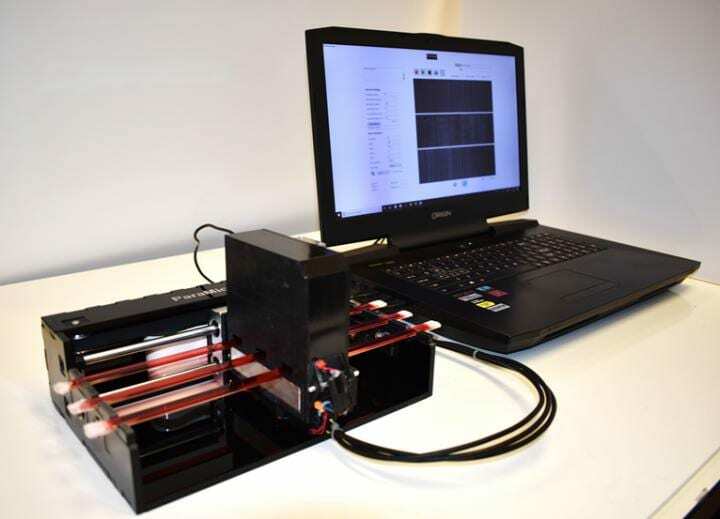 Instead of directly capturing a still image of the fluid sample and searching for parasites, this unique platform takes a different approach and detects motion within the sample. It records high-frame-rate videos of the holographic patterns of the sample illuminated with laser light. Then, a motion analysis algorithm analyzes these captured videos at the micro-scale and converts the locomotion of the target parasites within the sample into a signal spot, which is detected and counted using artificial intelligence. “Although motility is a common feature of various parasites and other disease-causing micro-organisms, its use as a fingerprint for diagnosis is highly underexplored and our work provides landmark results, highlighting this unique opportunity.” said Ozcan. The proof of concept of this device has been demonstrated using Trypanosoma parasites, which have multiple subspecies that cause sleeping sickness and Chagas disease. The detection limit of the device was quantified as 10 parasites per milliliter of whole blood, which is about 5 times better than the state-of-the-art parasitological detection methods. This improved detection limit may lead to a better capability to detect sleeping sickness and Chagas disease at an earlier stage, which is essential to improve the cure rate and reduce prevalence. Beyond trypanosomes, the authors also demonstrated the use of their device to detect Trichomonas vaginalis, highlighting that their technique is applicable to various parasites and motile microorganisms. The UCLA device is compact and lightweight (1.69 kg) and the cost of the prototype is less than $1850, which can be reduced to less than $800 when manufactured in larger volumes. “Thanks to its high sensitivity, ease-of-use, reduced cost and portability, we believe our technique can improve parasite screening efforts, especially in resource-poor areas and endemic regions.” said Hatice Ceylan Koydemir, a UCLA postdoctoral scholar, who is a co-author of this study. Other co-authors of the manuscript are Michelle M. Shimogawa, Sener Yalcin, Alexander Guziak, Tairan Liu, Ilker Oguz, Yujia Huang, Bijie Bai, Yilin Luo, Yi Luo, Zhensong Wei, Hongda Wang, Vittorio Bianco, Bohan Zhang, and Rohan Nadkarni. This study is supported by the NSF Engineering Research Center (ERC, PATHS-UP), NIH and the Howard Hughes Medical Institute (HHMI).